With so many great pies available I haven’t had to go too far out of my way to find candidates in my search for the best pies in Suffolk. That is certainly the case with Farmcafe & Foodmarket near Marlsford. It is right beside the A12 which is the main road in these parts and I had driven past many times. It is a bit like a glamorous service station. I had even stopped there before but, unaware they sold pies, I regrettably had some soup instead. Fortunately, we were alerted via Twitter that they had a formidable selection of pies so the next time I went in I was sure not to just get soup! The cafe itself does have pies available to eat in but I opted to go into the foodmarket and get a pie to take home. It was a nice little shop and I was pleased to see they were committed to local produce. The pie selection was quite impressive with three different sizes and a range of flavours to choose from. I opted for the Steak & Red Wine individual pie at £4.40. For an individual pie this was quite a high price, I think the highest I have paid. The Selfridges pies I purchased recently only cost £3.99 and £3.49. However, it was certainly worth paying a premium for this pie as it was clearly a premium product. The capacity was relatively big because the pie had a fantastic height to width ratio. You can see from the picture that this pie was small but mighty, it was as if they had packed a whole steak in there. The slow cooked steak was absolutely melt in the mouth and full of flavour. The red wine added a delicious fruityness to the filling. The shortcrust pastry was soft but with a bit of crunch, my preferred texture. There was just a slight hint of doughyness to the pastry. 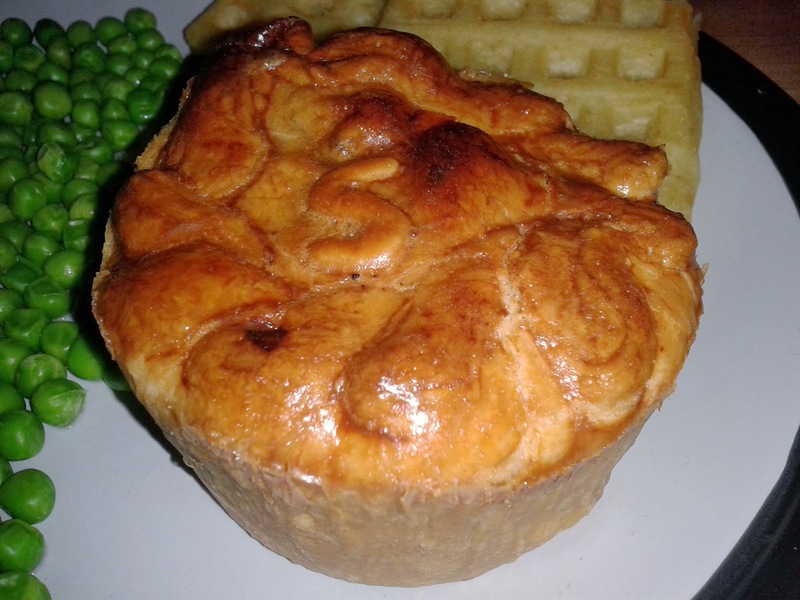 There wasn’t a lot of gravy in the pie, I normally like to have enough so that it oozes out slightly. In this case it wasn’t much of a problem as there was not a hint of dryness. In terms of looks it managed to obtain a perfect golden brown colour. The ‘S’ in the centre is a nice touch also used by others such as Paul’s Pies. 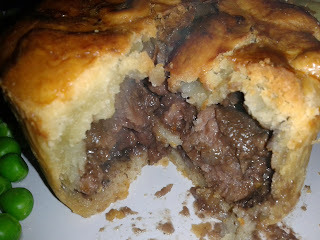 In fact the Farmcafe pie did appear to look just like a squashed version of Paul’s Steak & Guinness! Hopefully I have managed to express that I really enjoyed eating this pie. I was left wanting more, partly because it wasn’t the biggest pie and partly just because it was so good! Unfortunately, it does lose some points on the ‘Cheapness’ category. At £4.40 for what was quite a small pie it is something I would buy again, but not very often which is reflected in a score which is high enough to put it into the top three of our Suffolk pie rankings.